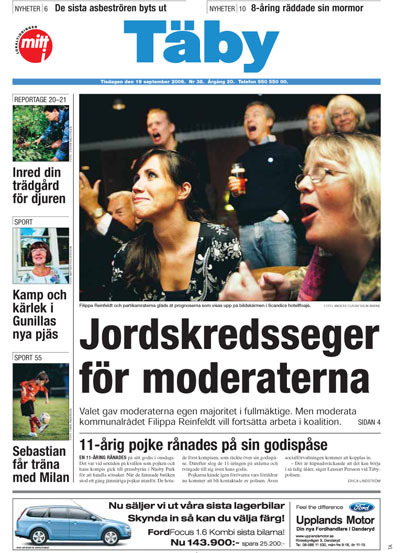 The dust has barely settled after yesterday’s launch of the new free daily Punkt SE, when yet another newspaper sees the light of day – Täby Danderyd Tidning, a bi-weekly local paper for the two cities Täby and Danderyd north of Stockholm. But this is not part of the current free daily craze that has hit the Nordic countries, no T&D; is a subscribed morning paper. While I admit that this part of greater Stockholm is in what could be considered “media shadow”, I admire their guts. The competition is stiff with three free dailies currently being handed out across the region and one (Mitt i Täby) being distributed directly to the local households. T&D; aims to be the leading local paper in the region within five years, and who knows, stranger things have happened. And while we are on the subject of new media investments, Aftonbladet today revealed the name for its new tv channel – TV7. Starting next Monday they threaten us with “Aftonbladet in a tv format”. What is surprising is that Aftonbladet two days in a row have launched new media projects that they don’t own the domain names for. Punkt.se is owned by Spray and TV7.se has been owned by a company called Esias Consulting KB since 2001 (contact name Svante Tegnér, the über-brat of Stockholm city). Esias Consulting KB lost a legal dispute for the domain sportnytt.se to SVT in 2003, but that was an old brand. TV7 is brand new and such a dispute may not be as easy to win for Aftonbladet.